Middle Aramaic was used from 300 B.C.E. to the early centuries C.E. Included are documents, in somewhat corrupt Aramaic, from Persia, India, Afghanistan, and the Caucasus. The Aramaic inscriptions of Jerusalem, Aramaic words found in the New Testament, the Nabatean Aramaic, the Palmyrean Aramaic, that of Hatra, of Dura-Europos, and (partly) the Aramaic ideograms of Middle Persian are all in Middle Aramaic. The Onkelos translation of the Bible (see *Targum ) also seems to belong to this period, as does the language of most of those scrolls from the *Dead Sea Scrolls written in Aramaic. The Uruk document which dates from this period is the only Aramaic document written in cuneiform. While the common denominator of all these dialects is their effort to imitate Official Aramaic, they also contain elements of Late Aramaic. Most of these versions were apparently not spoken. Regarding Modern Aramaic see *Neo-Aramaic . (2) Aramaic epigraphical material, spread over an area which extended north to Sardes in Asia Minor; south to the oasis Tēmā in the north of the Arabian Peninsula; southwest to southern Egypt (the Elephantine documents); and east to Persia (The Driver documents). The documents, some of them carved on stone, written on leather, papyrus, ostraca, clay, etc., include memorial inscriptions, contracts, bills, letters, official documents, seals, and legends written on weights, and as "dockets" in Akkadian legal documents, etc. All, except the Uruk document (see Middle Aramaic ), are written in an Aramaic alphabet which is a branch of the Canaanite alphabet (see *Alphabet , North-West Semitic – The Rise of Aramaic Script). Aramaic papyri as well as a number of ostraca Aramaic papyri were discovered on the isle of Elephantine near Syene (Aswan). The papyri are comprised of bills, letters, official documents (among them parts of a translation of a Behistun inscription), and parts of the Book of *Aḥikar (see *Elephantine ). A number of recently published documents also originated in Elephantine. Other Aramaic papyri discovered in Egypt come from Hermopolis; their language, more than that of any of the other material, resembles the language prevalent in Syria during that period. More than a dozen letters, and parts of letters, which were sent from the eastern part of Persia, probably from Shushan and Babylonia to Egypt, were also found in Egypt (see below; most of this material is from the fifth century B.C.E.). 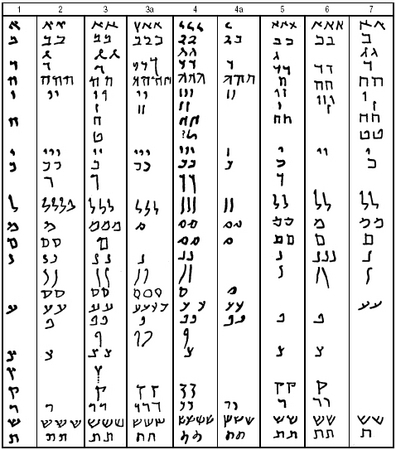 Examples of the Aramaic script. (1) Exodus fragment; (2) Bar Kokhba letter; (3) Bet Mashko letter; (3a) Signatures of witnesses to no. 3; (4) Signatures of witnesses on no. 4; (5) Dura-europos fragment; (6, 7) Bet She'arim tomb inscriptions (1–4a from Wadi Murabba'āt, i.e., before 135 C.E. ; 5–7 of the third century C.E.). When Aramaic documents began to be discovered in Asia Minor, Egypt, etc. (i.e., in countries that had never been inhabited by Arameans), it became clear that Aramaic had been an official language in the Persian Empire and that to some extent it had been a lingua franca. Aramaic apparently was also the lingua franca of the Assyrian Empire. Thus King Hezekiah's ambassadors implore the Assyrian commander Rab-Shakeh, "Speak, I pray thee, to thy servants in the Aramean language" (i.e., rather than in Hebrew or in Assyrian; Isa. 36:11; II Kings 18:26). This status of Aramaic is also reflected by the fact that the Nabateans, and the Palmyreans, who were Arabs and therefore not likely to use Aramaic as a spoken language, nevertheless wrote their inscriptions (mainly from the first century C.E.) in an Aramaic still based on Official Aramaic (see Middle Aramaic ). This also explains why Pahlavi (Middle Persian), which was the official tongue in Persia during the Sassanian dynasty, destroyed by the Arab conquest, employed Aramaic in written ideograms (the words were written in Aramaic, but read as Persian; cf. the English "e.g.," which stands for the Latin exempla gratia but reads "for instance"). Some of these ideograms go back to Official Aramaic of the days of the first Persian kings. Forms that originated in Official Aramaic can also be found in Jewish legal deeds that go back to the time of the Talmud and the *geonim. 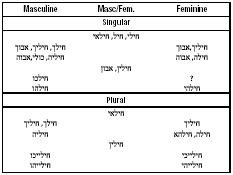 The two dialectal groups of Late Aramaic – Western Aramaic and Eastern Aramaic – have several common characteristics: (1) דנא "this" (masc.) 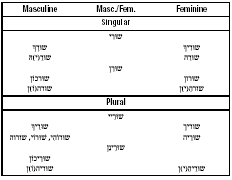 is replaced by other forms; (2) the prefix ה (+ vowel) of haphʿel (and other conjugations) is replaced by א (+ vowel); (3) all the dialects seem to possess the new conjugation ittaphʿal – passive of ʾaphʿel (see Middle Aramaic ); (4) the original form of the relative pronoun has almost entirely disappeared; instead the proclitic ד׳ is employed; (5) the internal passives of qal and hophʿal (see The Main Characteristics of Ancient and Official Aramaic – Differences in the Verb) have disappeared; (6) in all dialects the passive participle קטיל seems to be employed with certain verbs in the active voice (rare in Middle Aramaic), e.g., טעין ("carrying"); (7) in all the dialects, the participle has more or less (in some entirely) replaced the imperfect as the future tense, the imperfect being employed as a subjunctive (after the relative pronoun), a cohortative, and a jussive; (8) the prolepsis form is also found with the verb, e.g., עבדה למלתא literally "he did it the thing," when the object is determined; (9) many borrowings from Greek (less from Latin) are to be found in the dialects of Late Aramaic. (Only this dialect will be dealt with extensively here.) This is the dialect of the Aramaic parts of the Jerusalem Talmud, of the aggadic Midrashim, the Palestinian deeds, the Aramaic documents of the geonic period (found in the Cairo *Genizah ), and synagogue inscriptions discovered in Ereẓ Israel. The Palestinian Targum and the Targum Pseudo-Jonathan of the Pentateuch are written in a dialect which, for all practical purposes (except for a few details), is that of Galilean Aramaic. Dalman's grammar is outdated, Stevenson's work is of little significance, while in Odeberg's work only the chapters dealing with the syntax of Genesis Rabbah are useful. Fassberg's grammar deals with the Palestinian Targum Fragments, and Sokoloff 's work describes the language of the Genizah fragments of *Genesis Rabbah . A. All the literature until the mid-1930s may be found in F. Rosenthal, Die aramaistische Forschung seit Th. Nöldeke's Veröffentlichungen (1939); review by H.L. Ginsberg, in JAOS, 62 (1942), 229–38 (only a few important titles listed in Rosenthal's work will be mentioned below). ADD. BIBLIOGRAPHY: J.A. Fitzmyer and S.A. Kaufman, An Aramaic Bibliography, Part I: Old, Official, and Biblical Aramaic (1992). B. 1. Old Aramaic. (a) Grammar: G. Garbini, L'aramaico antico (ANLM series VIII, vol. 7, fasc. 5, 1956), is now outdated. R. Degen, Altaramäische Grammatik (in Abhandlungen für die Kunde des Morgenlandes, XXXVIII, 3, Wiesbaden 1969). ADD. BIBLIOGRAPHY: J.C. Greenfield, "The Dialects of Early Aramaic," in: JNES, 37 (1978), 93–99. For the position of Aramaic among North-Western Semitic languages see: W.R. Garr , Dialect Geography of Syria-Palestine, 1000–586 B.C.E. (1985). A very short survey of the scholarly literature may be found in the article by G. Garbini, "Semitico nord-occidentale e aramaico," in G. Levi Della Vida (ed. ), Linguistica semitica: presente e futuro (1961), 59–60; F.M. Cross Jr. and D.N. Freedman, Early Hebrew Orthography (1952), 21–34; also see Fitzmyer (see below), 177–232. (b) Texts: The collections of Aramaic Inscriptions in M. Lidzbarski, Handbuch der nordsemitischen Epigraphik (1889) as well as in G.A. Cooke, A Text-Book of North Semitic Inscriptions (1903) are still valuable. The material since Rosenthal's volume: J.A. Fitzmyer, The Aramaic Inscriptions of Sefîre (1995); H. Donner and W. Röllig, Kanaanäische und aramäische Inschriften, 3 vols. (1966–69; vol. 1, rev. 2002); J.J. Koopmans, Aramäische Chrestomatie, 2 vols. (1962); F. Rosenthal (ed. ), An Aramaic Handbook, 4 parts (1967, comprises texts from Old Aramaic to New Aramaic dialects). ADD. BIBLIOGRAPHY: P.-E. Dion, La langue de Ya'udi (1974); J. Tropper, Die Inschriften von Zincirli (1993); J.C.L. Gibson, Textbook of Syrian Semitic Inscriptions, vol. 2: Aramaic Inscriptions (1975); A. Abou-Assaf et al., La statue de Tell Fekherye et son inscription bilingue assyro-aramiènne (1982); A. Biran and J. Naveh, "The Tel Dan Inscription: A New Fragment," in: IEJ, 45 (1995), 1–18; M. Sokoloff, "The Old Aramaic Inscription from Bukan," in: IEJ, 49 (1999), 105–115. (c) Dictionaries: J. Hoftijzer and K. Jongeling, Dictionary of the North-West Semitic Inscriptions (1995); I.N. Vinnikov, Slovar arameyskikh nadpisey ("A Dictionary of the Aramaic Inscriptions"), in Palestinsky Sbornik, 3 (1958); 4 (1959); 7 (1962), 9 (1962); 11 (1964); and 13 (1965). 2. Official Aramaic. (a) Grammar: P. Leander, Laut-und Formenlehre des Ägyptisch-Aramäischen (1928); H. Bauer and P. Leander, Grammatik des Biblisch-Aramäischen (1927); H.B. Rosén, "On the Use of the Tenses in the Aramaic of Daniel," in: JSS, 6 (1961), 183–203. W. Baumgartner, H.H. Schaeder and H.L. Ginsberg (Rosenthal above A, 66–70, 70 note 3) are still important. S. Morag, "Biblical Aramaic in Geonic Babylonia," in Studies in Egyptology and Linguistics in Honour of H.J. Polotsky, ed. by H.B. 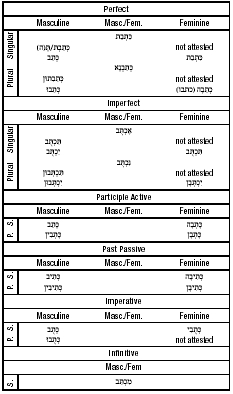 Rosén (1964), 117–31; Z. Ben-Ḥayyim, "The Third Person Plural Feminine in Old Aramaic," in Eretz-Israel, 1 (1951), 137–9 (Heb.). Also see F. Altheim and R. Stiehl, Die aramäische Sprache unter den Achaimeniden (1963). ADD. BIBLIOGRAPHY: T. Muraoka and B. Porten, A Grammar of Egyptian Aramaic (20032); M.L. Folmer, The Aramaic Language in the Achaemenid Period (1995); V. Hug, Altaramaeische Grammatik der Texte des 7. und 6. JH.S.V. Chr. (1993); F. Rosenthal, A Grammar of Biblical Aramaic (19956); E. Qimron, Biblical Aramaic (20022); E.Y. Kutscher, "Aramaic," in: T. Sebeok (ed. ), Current Trends in Linguistics (1971), vol. 6, 347–412. (b) Texts: A.E. Cowley, Aramaic Papyri of the Fifth Century B.C. (1923); E.G. Kraeling, The Brooklyn Museum Aramaic Papyri (1953); G.R. Driver, Aramaic Documents of the Fifth Century B.C. (1954), a second revised and abridged edition, Oxford 1957. ADD. BIBLIOGRAPHY: B. Porten and A. Yardeni, Textbook of Aramaic Documents from Ancient Egypt (1986–99); B. Porten and J. Lund, Aramaic Documents from Egypt: a Keyword-in-Context Concordance (2002). (Also see above 1b). (c) Dictionaries: (see above 1c) and L. Koehler and W. Baumgartner, The Hebrew & Aramaic Lexicon of the Old Testament (2001), vol. 2, 1805–2010; (the Aramaic part compiled by Baumgartner). 3. Middle Aramaic. (a) Grammar. Dead Sea Scrolls: J.A. Fitzmyer, The Genesis Apocryphon of Qumran Cave I (19712); E.Y. Kutscher, The Language of the Genesis Apocryphon (1958), 173–206 (= Scripta Hierosolymitana, 4 (1958), 1–35). ADD. BIBLIOGRAPHY: K. Beyer, Die aramaeischen Texte vom Toten Meer (1984; Ergaenzungsband 1004). Onqәlos type Targumim, see Dalman (below); P. Kahle, Masoreten des Ostens (1913), 203–32. ADD. BIBLIOGRAPHY: A. Tal, The Language of the Targum of the Former Prophets and its Position within the Aramaic Dialects (1975). Uruk: C.H. Gordon, "The Uruk incantation texts," in Archiv für Orientforschung, 12 (1938), 105–17, idem, in Orientalia, 9 (1940), 29–38. ADD. BIBLIOGRAPHY: M.J. Geller, "The Aramaic Incantation in Cuneiform Script (AO 6489-TCL 6,58)," JEOL, 35/36 (1997–2000), 127–46. Nabatean: J. Cantineau, Le nabatéen, 1 (1930); Palmyrean: J. Cantineau, Grammaire du palmyrénien épigraphique (1935); F. Rosenthal, Die Sprache der palmyrenischen Inschriften und ihre Stellung innerhalb des Aramäischen (1936). ADD. BIBLIOGRAPHY: D.R. Hillers and E. Cussini, Palmyrene Aramaic Texts (1996). Hatra: A. Caquot, in: Groupe linguistique d'études chamito-sémitiques, 9 (1960–63), 87–89; R. Degen, in: Orientalia, 36 (1967), 76–80. (b) Texts. Various inscriptions: above 1b; Donner-Röllig, Koopmans, Rosenthal. ADD. BIBLIOGRAPHY: Y. Yadin et al., The Documents from the Bar Kokhba Period in the Cave of Letters (2002); A. Yardeni, Textbook of Aramaic, Hebrew and Nabataean Documentary Texts from the Judaean Desert (2000); S. Abdal-Rahman al-Theeb, Aramaic and Nabataean Inscriptions from North-West Saudi Arabia (1993). Onqәlos type Targumim: A. Sperber, The Bible in Aramaic, 3 vols. (1959–62; The Pentateuch, the Latter Prophets). Place of origin: Kutscher, The Language …, above (a). Dead Sea Scrolls: Fitzmyer, above (a), bibliography, ibid., p. 24, note 67; Nabatean: Cantineau, above (a) 2 (1932); Revue Biblique, 61 (1954), 161–81; IEJ, 12 (1962), 238–46. Palmyrene: Rosenthal, above (1b); various publications mainly in the periodicals Syria and Berytus and Inventaire des inscriptions de Palmyre, 11 fascicules, by various editors (1930– ). Hatra: Rosenthal, above (1b); Degen above (a), p. 76, note 1. Dura-Europos: Koopmans above (1b) 1 (1962), p. 219; E.L. Sukenik, The Synagogue of Dura-Europos and its Frescoes (Hebrew 1947). Nisa: I.M. Diakonov and V.A. Livshitz. Dokumenty iz Nisi ("Documents from Nīsa," Moscow 1960); M. Sznycer, in: Semitica, 12 (1962), pp. 105–26; Lešonénu, 34 (1969/70); Inscriptions of Jerusalem: M. Avi-Yonah (ed. ), Sepher Yerushalayim 1 (1956), 349–57. Aramaic in the New Testament: H. Ott, in: Novum Testamentum, 9 (1967), 1–25 (Ger. ; bibliography). Important are G. Dalman, Die Worte Jesu (19302) and H. Birkeland, The Language of Jesus (1954). (c) Dictionaries: Hoftijzer and Jongeling, above (1c); M. Sokoloff, A Dictionary of Judean Aramaic (2003). Dead Sea Scrolls: M.G. Abegg et al., The Dead Sea Scrolls Concordance (2003), vol. 2, 775–946. Targum: Levy's dictionary of the Targumim is outdated, but G.H. Dalman, Aramäisch-neuhebräisches Handwörterbuch (1922) is still important. J. Cantineau, Le nabatéen above (a) 2 (1932). Glossaries are to be found in various volumes listed above (a) and (b). 4. New Aramaic. I Western Branch. (a) Grammars. Galilean Aramaic: G. Dalman, Grammatik des jüdisch-palästinischen Aramäisch (Leipzig, 19052); W.B. Stevenson, Grammar of Palestinian Jewish Aramaic (Oxford, 19622; not important); H. Odeberg, The Aramaic Portions of Bereshit Rabba, part 2 Short Grammar of Galilaean Aramaic, in section 1, vol. 36; no. 4 (1940); E.Y. Kutscher, "Studies in Galilaean Aramaic" (Hebrew) in: Tarbiz, 21 (1950), 192–205; 22 (1951), 53–63, 185–192; 23 (1952), 36–60. ADD. BIBLIOGRAPHY: S.E. Fassberg, A Grammar of the Palestinian Targum Fragments (1990). Christian Aramaic of Palestine: F. Schulthess, Grammatik des christlich-palestinischen Aramäisch (1924). ADD. BIBLIOGRAPHY: M. Bar-Asher, Palestinian Syriac Studies (1977); C. Müller-Kessler, Grammatik des Christlich-Palaestinisch-Aramaeischen (1991); Samaritan Aramaic: No up-to-date grammar of Samaritan Aramaic exists. See E.Y. Kutscher 's short sketch in Tarbiz, 37 (1968), 399–403 (Hebrew); A.E. Cowley The Samaritan Liturgy2 (1909), XXXV–XLI is now outdated. (b) Texts: L. Ginzberg, Yerushalmi Fragments from the Genizah (Hebrew), 1 (1909). Other fragments were published mainly by J.N. Epstein in Tarbiz (Hebrew) vol. 3 (1932). Several scholarly editions of Midrash used Genizah material (Bereshit Rabbah, Va-Yikra Rabbah, Pesikta de Rav Kahana), see respective entries. A. Diez-Macho, Neophyti, 1 (1968–79). ADD. BIBLIOGRAPHY: M.L. Klein, Genizah Manuscripts of Palestinian Targum to the Pentateuch (1986); M. Sokoloff and J. Yahalom, Jewish Palestinian Aramaic Poetry from Late Antiquity (1999); M. Sokoloff, The Geniza Fragments of Bereshit Rabba (1982). Documents (שטרוֹת) from the Genizah: mainly S. Assaf, in: Tarbiz, 9 (1938), 11–34. Inscriptions: J.B. Frey, Corpus Inscriptionum Iudaicarum, 2 (1952; many misprints); Sefer ha-Yishuv, 1, pt. 1 (1939), passim, and various Israel periodicals. As to the importance of most of the texts listed above see Kutscher , above (a). Christian Aramaic of Palestine: M. Black, A Christian-Palestinian Syriac Horologion (1954). Samaritan Aramaic: A. Tal, The Samaritan Targum of the Pentateuch (1980–83). Very important is Z. Ben-Ḥayyim, The Literary and Oral Tradition of Hebrew and Aramaic amongst the Samaritans, 3 pt. 2 (Hebrew, 1967), which contains texts transliterated according to the orally preserved reading tradition of the Samaritans, cf. my review in Tarbiz above (a); J. Macdonald, Memar Marqah, vol. 1 Text, vol. 2 Translation (1963) (without transliteration); cf. review by Z. Ben-Ḥayyim, in Bibliotheca Orientalis, 23 (1966), 185–91 (Eng. ); Z. Ben-Ḥayyim, Tibat Marque: A Collection of Samaritan Midrashim (1988). Also see Z. Ben-Ḥayyim , Studies in the Traditions of the Hebrew Language (1954), 112–9 (with the transliteration and English notes). (c) Dictionaries: M. Sokoloff, A Dictionary of Jewish Palestinian Aramaic (1990); see also the works of Levy, Jastrow, Kohut, Dalman, and the Additamenta to Kohut. Review of the Additamenta: S. Lieberman, in Kirjath Sepher (Hebrew). Important remarks are to be found in various works of J.N. Epstein and S. Lieberman and Yalon. Bibliography: Tarbiz 20 (1949), 5–50 (Epstein); Hadoar (Heb. ), 43 (1963), 381–4; (Lie berman, in: H. Yalon Jubilee Volume (1963), 1–14). Very important is I. Löw, Die Flora der Juden, 4 vols. (1924–34), see also Rosenthal above (1b), Part 1/2, Glossary. Problems of the lexicography see infra II (c) (Kutscher). Samaritan Aramaic: A. Tal, A Dictionary of Samaritan Aramaic (2000); important is the Hebrew-Arabic-Samaritan Aramaic glossary (HMLYS) published by Z. Ben-Ḥayyim, The Literary and Oral Tradition … (above b), vol. 2 (Jerusalem 1957), 439–616. Christian Aramaic of Palestine: Only F. Schult hess, Lexicon Syropalaestinum (1903), is available and the glossary in his Grammatik, above (a). II The Eastern Branch. (a) Grammar. Syriac. Th. Nöldeke's Kurzgefasste syrische Grammatik (18982) was reprinted by A. Schall (1966), with a few additions (from Nöldeke's copy); J.B. Segal, The Diacritical Point and the Accents in Syriac (1953); C. Brockelmann, Syrische Grammatik (19608); F. Rundgren, "Das altsyrische Verbalsystem" in: Sprakvetens kapliga Sallskapets i Uppsala Forhandliger (1958–60), 49–75. ADD. BIBLIOGRAPHY: T. Muraoka, Classical Syriac (1997). Syriac inscriptions: K. Beyer, ZDMG, 116 (1966), 242–54. ADD. BIBLIOGRAPHY: H.J.W. Drijvers and J.F. Healey, The Old Syriac Inscriptions of Edessa & Osrhoene (1999). Mandaic: R. Macuch, Handbook of Classical and Modern Mandaic (1965), but, Th. Nöldeke, Mandäische Grammatik (1875), is still very important. See also E.M. Yamauchi, Mandaic Incantation Texts (1967), 69–152. Aramaic of Talmud Bavli: J.N. Epstein, A Grammar of Babylonian Aramaic (Hebrew, 1960), cf. E.Y. Kutscher's review in: Lešonénu (Hebrew), 26 (1961/62), 149–83. M.L. Margolis, Lehrbuch der aramäischen Sprache des Babylonischen Talmuds (1910) is still useful. (There exists also an English edition. ); M. Schlesinger, Satzlehre der aramäischen Sprache des Babylonischen Talmuds (1928). Also important are the reviews of Levias' both editions (see Rosenthal ) by S. Fraenkel, in: Zeitschrift für hebräische Bibliographie, 5 (1901), 92–94; C. Brockelmann, in: MGJW, 76 (1932), 173–8. B. Kienast, in: Münchner Studien zur Sprachwissenschaft, 10 (1957), 72–76. 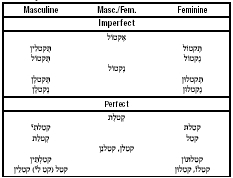 The Language of the Geonim and Anan: J.N. Epstein, in JQR, 5 (1914/15), 233–51; (1921/22), 299–390. Yemenite Tradition: S. Morag, in: Phonetica, 7 (1962), 217–39; Tarbiz, 30 (1961), 120–9 (Hebrew), English summary p. 11 of the issue; Henoch Yalon Jubilee Volume (1963), 182–220 (Hebrew); Lešonénu, 32 (1968), 67–88. ADD. BIBLIOGRAPHY: Babylonian Aramaic: The Yemenite Tradition (1988); Morag and Y. Kara, Babylonian Aramaic in the Yemenite Tradition: The Noun (2002). Incantation texts: W.H. Rossell, A Handbook of Aramaic Magical Texts (1953); Epstein in REJ, 73 (1921), 27–58; 74 (1922), 40–82. ADD. BIBLIOGRAPHY: J. Naveh and S. Shaked, Amulets and Magic Bowls (1985); idem, Magic Spells and Formulae (1993). (b) Texts. Syriac. Only inscriptions discovered mainly by J.B. Segal are worth mentioning; E. Jenni in: Theologische Zeitschrift, 21 (1965), 371–85 (bibliography pp. 371–7); Segal in BSOS, 30 (1967), 293–304; also see J.A. Goldstein , in: JNES, 25 (1966), 1–16. 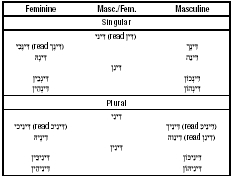 Mandaic: See the list of Abbreviations of Macuch, supra (a), pp. XXXVII–XLI. Aramaic of Talmud Bavli: S. Sassoon (ed. ), Sefer Halakhot Pesukot (1950) (Gaonic Literature). As to the Talmud itself: Sh. Abramson has published a manuscript of Tractate ʿAvodah Zarah (1957); M.S. Feldblum, Dikdukei Soferim, Tractate Gittin (1966) continues the series. To Oẓar ha-Ge'onim, ed by B.M. Lewin, Berakhot-Bava Kamma 1943 (12 vols.) was added part of Bava Meẓi'ah (posthumously, no editor and other data are given), as well as Ch. T. Taubes, Sanhedrin (1966). (c) Dictionaries. Syriac: No new dictionary has appeared. C. Brockelmann, Lexicon Syriacum (19282) is the best lexicon of any Aramaic dialect. Mandaic: E.S. Drower and R. Macuch, A Mandaic Dictionary (1963). The Aramaic of Babylonian Talmud see above (Ic); M. Sokoloff, A Dictionary of Jewish Babylonian Aramaic (2002). Problems of a new dictionary of Jewish Aramaic (and Mishnaic Hebrew) dialects: E.Y. Kutscher, in: Hebräische Wertforschung ed. by B. Hartmann and others (1967), 158–75; Rosenthal (1b) part 1/2 (Glossary). Ḥ.J. Kassovski, Thesaurus Talmudis, Concordantiae Verborum, 18 vols. (1954– ). Foreign influences upon Aramaic. Akkadian: H. Zimmern, Akkadische Fremdwörter als Beweis für babylonischen Kultureinfluss (1917). ADD. BIBLIOGRAPHY: S.A. Kaufman, The Akkadian Influences on Aramaic (1974); see also the remarks of B. Geiger in the Additamenta ad Aruch Completum above (Ic). Persian: Geiger, ibid. ; Widengreen Hebrew-Canaanite needs a monograph. Greek and Latin: S. Krauss, Griechische und lateinische Lehnwörter in Talmud…, 2 vols. (1898–99) is outdated, but cannot be dispensed with. Reviews: Fraenkel, in: ZDMG, 52 (1898), 290–300; 55 (1901), 353–5 with S. Lieberman, Greek in Jewish Palestine (1950), as well as his Hellenism in Jewish Palestine (1950), and many other books and articles, see his bibliography in Hadoar, 43 (1963), 381 ff. A. Schall, Studien über griechische Fremdwörter im Syrischen (1960). Aramaic influences upon other languages. Akkadian: W.V. Soden, Grundriss der akkadischen Grammatik (1952), 192, 193, 196; idem, in: Orientalia, 35 (1966), 1–20; 37 (1968), 261–71. Biblical Hebrew: G.R. Driver, "Hebrew Poetic Diction," in: Congress Volume, Supplements to Vetus Testamentum, 1 (1953), 26–39. M. Wagner, Die lexikalischen und grammatikalischen Aramaismen im Alttestamentlichen Hebräisch (1966). Also see E. Kautzsch , Die Aramäismen im A.T. (1902). Canaanite-Punic: E.Y. Kutscher, in: Lešonénu, 33 (1969), 105–7; Dead Sea Scrolls: E.Y. Kutscher, The Language and Linguistic Background of the Isaiah Scroll (Hebrew, 1959), 8–13, 141–63. Mishnaic Hebrew: H. Albeck, Introduction to the Mishnah (Hebrew, 1959) lists (pp. 134–52) words parallel in both languages. Arabic: S. Fraenkel, Die aramäischen Fremdwörter im Arabischen (1886) is still very important. M.T. Feghali, Etude sur les emprunts syriaques dans les parlers arabes du Liban (1918); G. Dalman, Arbeit und Sitte im Palestina 7 vols. (1928–42) passim. ADD. BIBLIOGRAPHY: W. Arnold and P. Behnstedt, Arabisch-Aramaeische Sprachbeziehungen im Qalamūn (Syrien) (1993). European languages: K. Lokotsch, Etymologisches Wörterbuch der europäischen… Wörter orientalischen Ursprungs (1927), 241; W.B. Henning, in: Orientalia, 4 (1935), 291–3; E.Y. Kutscher, Words and their History (1961), 13–16. The influence of Aramaic on Modern Hebrew: I. Avinery, The Achievements of Modern Hebrew (1946), 72–80. ADD. BIBLIOGRAPHY: M. Bar-Asher, in: Evolution and Renewal: Trends in the Deveolpment of the Hebrew Language (1996), 14–76.